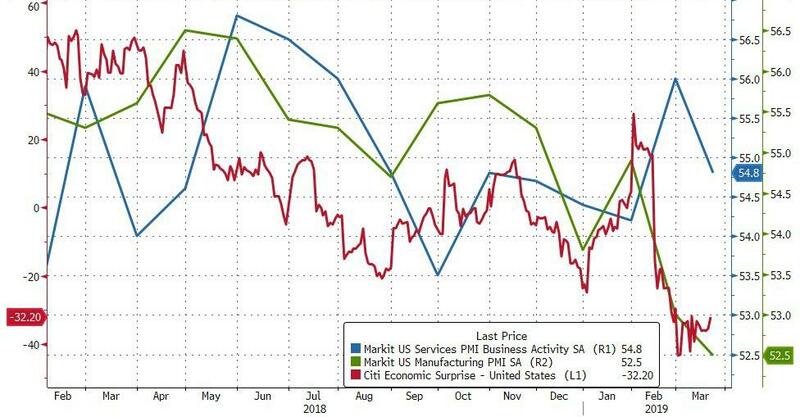 Following February's very mixed picture (Services soared, Manufacturing tumbled), PMIs were expected to revert modestly in March (especially following this morning's collapse in German PMI). 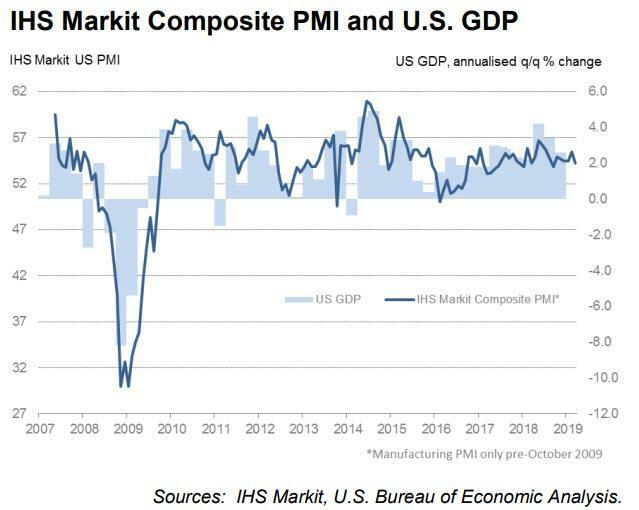 “US businesses reported a softer end to the first quarter, with output growth easing to the second lowest recorded over the last year. “A gap has opened up between the manufacturing and service sectors, however, with goods-producers and exporters struggling amid a deteriorating external environment and concerns regarding the impact of trade wars. The survey is consistent with the official measure of manufacturing production falling at an increased rate in March and hence acting as a drag on the economy in the first quarter. “At the moment, the service sector appears to be holding up relatively well. But the worry is that manufacturing woes are spreading to service providers, via reduced demand for services such as transport and storage as well as deteriorating business optimism about the outlook – which fell to the lowest for nearly three years in March – and a cooling of the labour market. The survey showed hiring across both manufacturing and services hit the weakest for just under two years in March. "The PMI survey data nevertheless remain encouragingly resilient, indicative of the economy growing at an annualised rate in excess of 2% in the first quarter, suggesting some potential upside to many current growth forecasts."